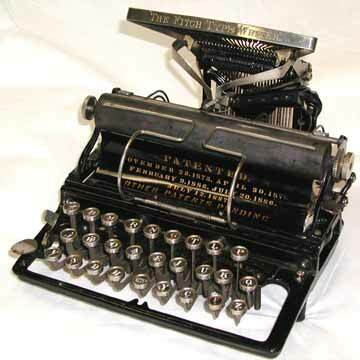 The Fitch typewriter was an American invention by Eugen Fitch of Des Moines, Iowa. He was granted a patent on the design in 1887 and the first machine was produced by the Fitch Typewriter Company of Des Moines and later by teh Brady Manufacturing Company of Brooklyn. This is the American version of the Fitch that is slightly different from the British Fitch (see separate entry). The American Fitch had an elaborate patent plate on the front, as the base of the paper basket.Two very early patents are also mentioned on the Williams typewriter that was built by the same Brady company. Picture 6 shows the downstrike system, with the ink roll that was used for inking. The system was actually based on an earlier design by a different inventor for a blind writing upstrike typewriter. Picture 2 shows the Fitch in the bottom half of the case. The lid is missing. See the book â€œTypewriterâ€� page 94 for more details.